Between 1820 and 1880, some 150,000 Jews joined in the vast “German” migration to America, leaving central and eastern Europe at a rate several times that of non-Jews. Ninety percent of these Jewish immigrants came from families who made their living in some form of trade. Among those who settled in South Carolina were the four Friedheim brothers, sons of a merchant family from the towns of Münder and Springe, Germany. Arriving in New York harbor in 1857, at age 17, Arnold Friedheim worked first in Baltimore as a shipping clerk for a wholesale dealer in men’s clothing, and then in Salisbury, North Carolina. When the Civil War broke out he joined the 4th Regiment of North Carolina Volunteers, fought at Chancellorsville, First and Second Manassas, and Gettysburg, and was at Appomattox when General Robert E. Lee surrendered. 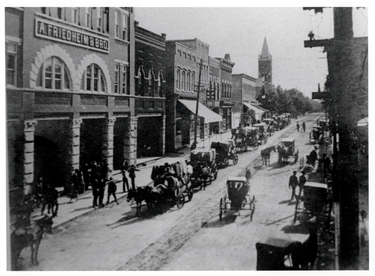 In 1866, when Rock Hill, South Carolina, was only a village on the Charlotte/Columbia Railroad, Friedheim opened a small store on Main Street. His first stock was shoes. Three years later the business moved across the street and Arnold’s brother Julius joined the firm. In 1898, a fire left A. Friedheim & Bro. in ruins. Within a year, they had rebuilt the structure on the model of John Wannamaker of Philadelphia. A third brother, August, ran a dressmaking plant in Rock Hill, and Samuel Friedheim, the fourth brother, operated a country store that served the farm community between Rock Hill and Fort Lawn.